We love to give our dogs treats, whether it's a reward during training, for general good behavior, or just for no reason at all. Choosing the appropriate treat varieties can help keep our dogs healthy and happy. Treats can enhance a healthy diet and should never make up more than 10% of a dog’s daily food intake. 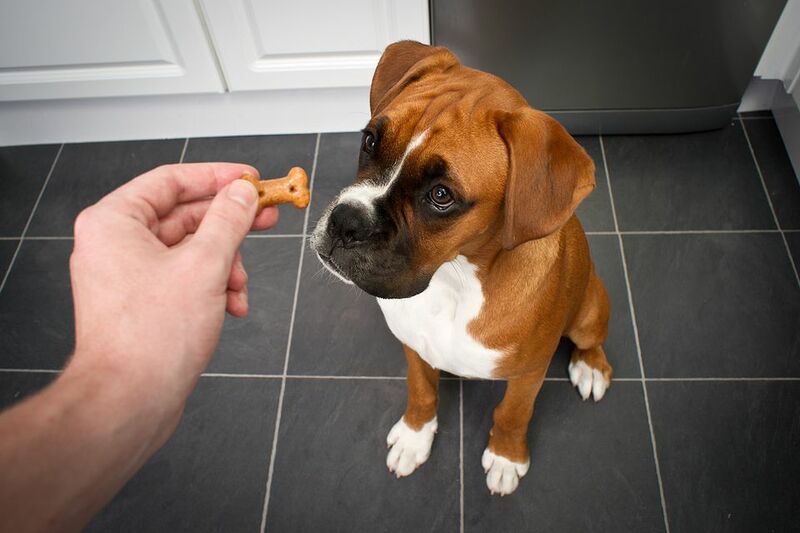 Learn about the types of dog treats available and decide which are best for your dog. Hard, crunchy treats, sometimes called dog biscuits, are available in a variety of flavors, shapes, and sizes. The size of the treat should be appropriate for the size of your dog. Choose a brand that meets the same standards as high-quality dog foods. Crunchy dog treats make great everyday rewards for your dog. Soft, chewy treats are also available in a variety of flavors, shapes and sizes. These treats are especially useful during training due to their pleasing taste and soft texture. Use small sizes during training for immediate gratification. If your dog can eat the treat fast, the message of it being a reward is made clear. Choose dog treat brands that meet the same standards as high-quality dog foods. Freeze-dried and jerky treats, when made especially for dogs, offer a tasty morsel similar to human food. These treats are usually available in a variety of forms such as meats, liver, poultry, and seafood. Many dog owners find these treats to be very effective for use when training because of their desirable flavor. Make sure to find a good source for jerky treats, like a reputable US company. Or, you can make your own meat jerky treat for your dog with a food dehydrator. Dental chews and bone-like treats are not made from animal bones. Some are made from corn starch or other digestible materials. Because of the degree of chewing required to consume these treats, some experts believe they promote dental health. 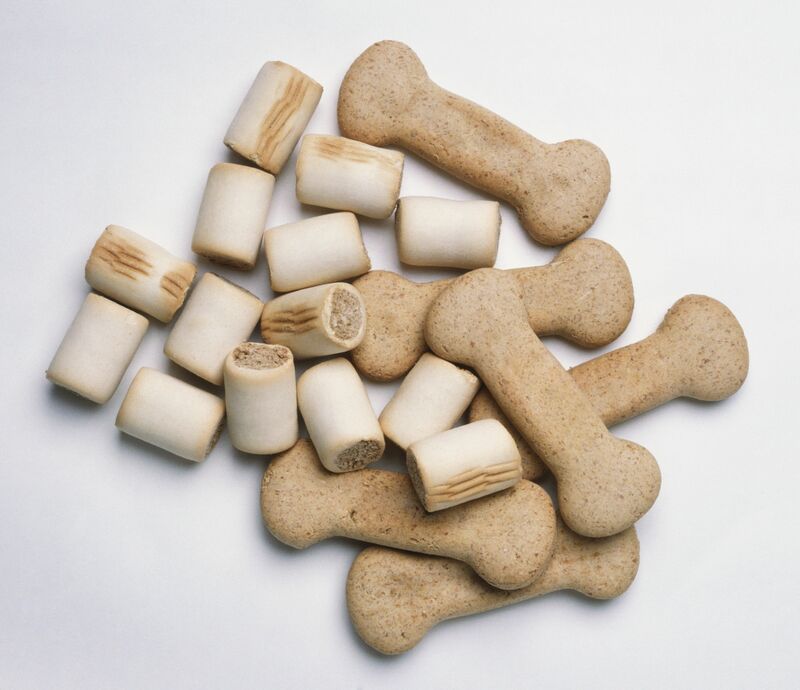 Though safer than real bones, these treats can still cause a gastrointestinal blockage if “gulped”. In addition, if the treat is too hard, it can cause tooth fractures or oral injuries. Always choose the appropriate size chew for your dog. Don't pick a chew that hurts if you bang it on your knee--this means it's too hard for your dog's teeth. Be sure your dog is supervised when consuming any type of chew. Bones and hooves from animals should generally not be given to dogs. These can cause chipping or breaking of teeth as well as gastrointestinal perforation or blockage. Bones and hooves can be very harmful to all types of dogs, but the most dangerous are cooked bones and any kinds of poultry bones (cooked or raw). This goes for deer antlers, too--they are simply too hard to be safe. Offer your dog dental chews and other digestible bone alternatives instead. Rawhide is generally not recommended for dogs unless it is specially treated for digestibility. Made from animal hide and often treated with various chemicals, rawhide can sometimes cause gastrointestinal obstructions or other complications. Try feeding corn starch-based "bones" or dental chews instead. Some types of rawhide are specially developed by veterinarians to be digestible and good for the teeth. Ask your vet about these options. Made from the ears of pigs, these are delicious yet fatty treats for your dog. They can also be processed with chemicals that can be considered unsafe. Pig ears should be avoided, especially in dogs at risk for obesity. If you can find a source of pig ears that are not overly treated with chemicals, they should still be kept to a minimum due to their high fat content. Giving human food to dogs can be good or bad depending on the type of food. Foods to avoid include but are not limited to cheese, hot dogs, crackers, cookies, and other similar "table scraps". Fresh foods such as carrots, apples, lean meat, poultry or seafood can actually be beneficial to your dog. Treats made from human foods should not contain any seasonings or sauces. Never give your dog grapes, raisins or onions as these are poisonous foods. Garlic can be hazardous as well and should be used sparingly and only under the direction of a veterinarian. Consult your veterinarian about the safety of all human food before giving it to your dog. Treats for dogs on special diets are sometimes manufactured by the same food company that makes the special diet. If not, ask your veterinarian if there is an appropriate substitute. You can also make homemade dog treats with permissible ingredients, or even from the canned version of your pet’s special diet.